In which a noble opponent changes the game. No new magic sites, but three different positive random events. The total haul for the turn is 500 gold, a few Water gems, and an Amber Clan mage. I'm actually quite pleased about getting a free aquatic W2 mage. There's a lot that he can do for me. I place a bunch of orders but really there's no point discussing them because I tend to just show the results. It's all about the ends, people. The means... well, sometimes it's better that they remain a secret. I received a message from my neighbor T'ien Ch'i. He has one fort left, and I have it under siege. Everything else has been grabbed by Hinnom and Pangaea. Along with that message I receive a few things. Oh, T'ien Ch'i. A good friend. I will miss you. I promise to make use of this bounty that you have bestowed upon me. Thanks to independent mages I can make use of all these gems, and my supply of Hammers is quite limited so that will be put to good use as well. Getting almost a hundred Astral gems is really tremendous right now, I can't even fully describe it. I'm sitting on a province that lets me recruit S3 mages and I'm recruiting one each turn, I've got increasingly steep demands for all the summons and forging and battlemagic going on. A free Wish worth of gems is just fantastic. In which violence and commerce are made in equal measure. Remote site searching turns up three sites in two provinces that provide a total of 3 Earth and 1 Death gems of income. Random events net me another 600 gold. I summon the third and final Water Queen. Limne doesn't summon minions, instead she has Amphibious. Also her cross path is Earth, which doesn't directly help me very much at this precise moment. It will come in handy later, though! Like the other water queens she has recuperation and a lot of regeneration and cold resistance. 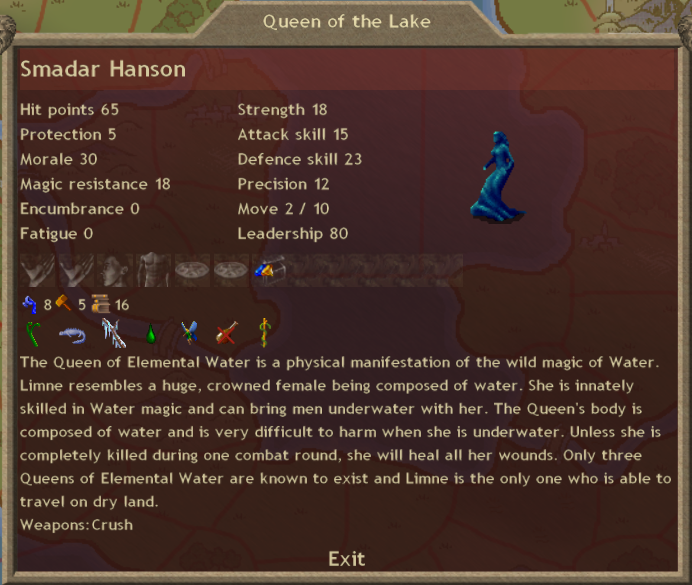 I'll be honest, the Water Queens are probably the most limited of all the royalty given that two of them are aquatic only and in general their strengths lie in securing underwater provinces that are usually much less valuable than those above water. That being said, I now have the ability to completely cover a battlefield with Cleansing Water. In a game with so many Blood (read: demon-summoning) nations that is going to go a long way to keeping me competitive. In other news one of my Sleeper Agents (the Shadow Seers) summons a Telestic Animate this turn. The Shadow Seer province is adjacent to Arcoscephale's old home province, and the only way to get there is to travel through a few underwater provinces. It is somewhat far removed from the rest of my empire, and yet very important to me. 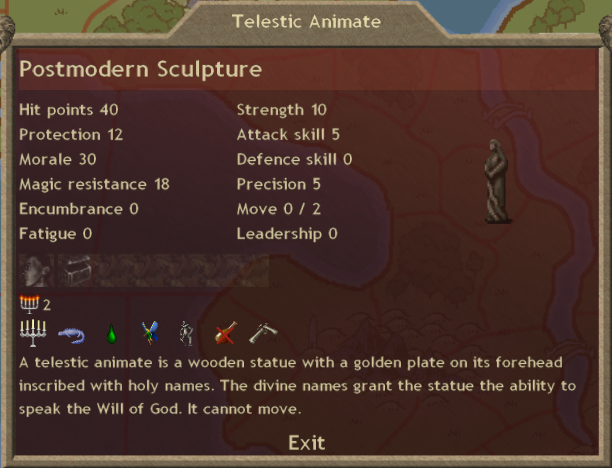 This handy statue can build a temple (and does, this turn) and after that he can and will start sacrificing blood slaves. A handful of commanders have been trading off the construction of a fortress in this province as well, and that is now complete. Next turn I will have a fully fortified base of operations here on Mictlan's border, and a fairly well-secured means of Astral Mage production. I attacked the two adjacent provinces that I could reach this turn. One attack saw my fully grown (but unequipped) Wendigo defeat some monkey PD. 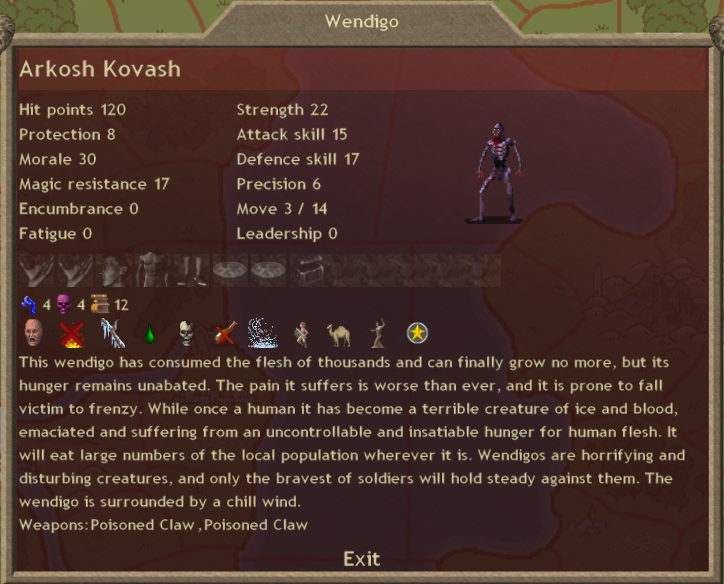 A fully grown Wendigo is pretty cool, but they do take such a long time to get there. The other attack pitted my Bane Lord prophet and the Daughter of Typhon along with two turns of her spawn... against some monkey PD. These fights were definitely anticlimactic. Nevertheless, my continued growth puts me in third place on every metric except for gold income (I'm first) and research (I'm second to last). I traded some stuff (including two ever-so-valuable Amulets of the Fish) to get three Dwarven Hammers from Hinnom. builds character has some reservations about the continued viability of our alliance in general, and as a result this trade comes with a note. A recording of the scene. EDIT: Apologies for the lack of a map, I sort of ran out of time posting this update. I'll put one up with the next update as is the new normal.